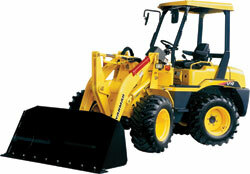 Crews can equip the V-Series loaders with an optional Quick-Coupler that fits most skid-steer attachments. A fully automatic drive mode allows the 6,750-pound V3-6 and 7,651-pound V4-6 loaders to accelerate more smoothly and change gears with no operator input. The three-cylinder, water-cooled diesel engine generates 30.3 horsepower (hp) and can propel the V3-6 up to 11.8 mph. The V4-6 features a 40.4 hp version of the engine, reaching a similar maximum speed. The loaders have a lifting capacity of 5,760 pounds for the V3-6 and 7,451 pounds for the V4-6.